Months ago, some friends of ours very generously offered to donate their toddler bed, which their two girls had long since grown out of. Thinking ahead, Tom and I eagerly accepted, but even once Abby was old enough to try it out, we had nowhere to set it up in our tiny one bedroom-plus-den apartment. So, Abby's Godmother, who is neighbor to these friends, offered to store it for us, and it has been in her attic until just a couple of days ago, when Tom brought it over to set up in Abby's room here at the new house. I feel two ways about finally getting to use it. Part of me is impatient for her to adjust to it quickly, so that the crib (and room in which it sits) will be available for Michael. Given his waking schedule, he'll be in the master bedroom at night for the immediate future, but I would like to start putting him down for naps upstairs so that I can actually unpack and arrange things in my bedroom. The chaos in there is driving me a little nuts, but nothing can be done about it as I am either elsewhere in the house with Michael, or enjoying a brief moment of peace while he naps inside. I am terrified, however, at the thought of leaving her alone in a room without me. I had great plans to absolutely baby-proof the room, and possibly to set up some kind of video monitor to boot. But certain things will be difficult to keep away from her, such as the fan that we have going at all hours to keep it cool (her bedroom is an attic dormer), and even if I did pony up the money for a video monitor, I'm sure it can't cover every corner of the room. Right now, though, I'm trying not to think about that part, and am trying to enjoy her excitement as she realizes that she now has a little "Big-Girl Bed," all her own. When we first brought her into the room to see it, she seemed to know immediately what it was and its significance, and we got a great reaction as a result. Actually getting her to sleep in it, I know, will be another matter entirely, though. Interestingly, I did have a successful run of it for that first morning nap yesterday. I brought Michael into the room, intending to lie on the floor with him beside her bed as she fell asleep. However, he foiled my plans initially by proceeding to scream for ten or so minutes as I tried to calm him, sans binky- silly me, I thought I could nurse him to sleep, but he had other plans- without getting up. I was afraid that walking around would encourage Abby to do the same, when she was already comfortably nestled in the bed. She was unable to settle in as a result, and got out of the bed to explore the room instead. When I saw that she was occupied with one of her night-time storybooks, I quickly snuck downstairs to grab a binky for Michael, and came back up to try again. I lay Abby back down on her bed, and laid myself down on the floor next to her, with Michael beside me. Unfortunately, just as he started to get sleepy, she started to get anxious again. I left him to continue falling asleep by himself (this does actually work maybe 5% of the time, so I crossed my fingers) and tended to Abby again. As I lay my head down by her feet, and my arms over her legs and tummy, I could feel her relaxing, though I did wonder if I was setting a bad precedent by doing so. We stayed that way for maybe five minutes, when I carefully lifted my head to sneak a peek. She was out! And so was little Michael, on the floor beside her. And here's a shot of the two of them. Unfortunately, Michael's deep sleep did not last for long- perhaps an hour. But I grabbed him up and managed to abscond with him down the stairs before Abby was at all disturbed. She had a nice long nap in her Big-Girl Bed, and woke up all smiles. 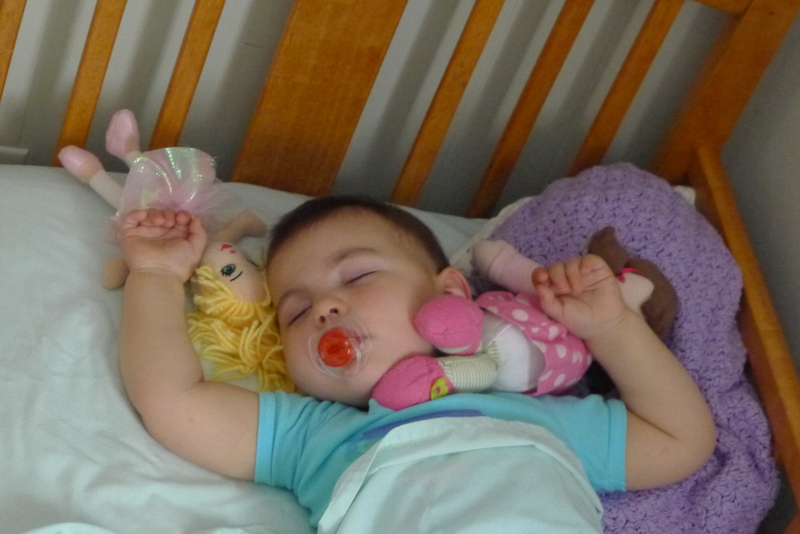 Sadly, she would not settle down for her afternoon nap, and ended up back in the crib. 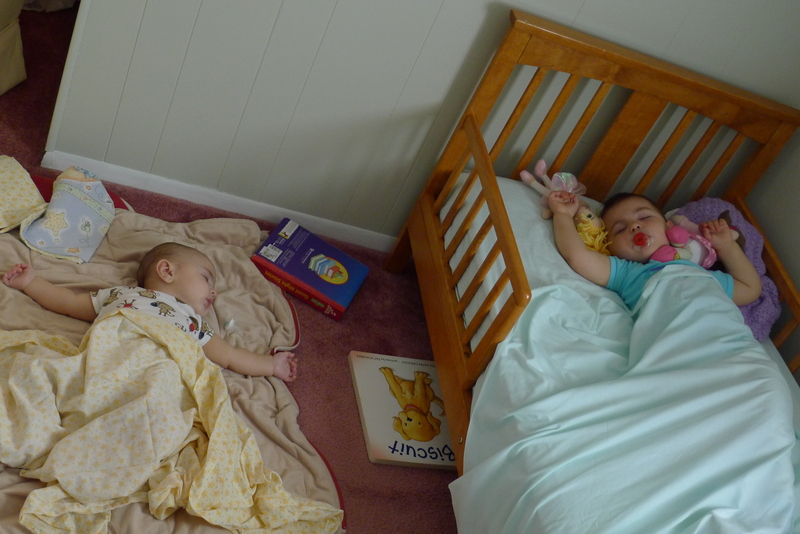 The same thing happened for the one nap that she fit in today (a rarity, since even though she's over nineteen months now, we nearly always need two naps to get through the day without meltdowns galore). But I understand that it will be a process for both of us, and when all is said and done, I'm not so sure I'm really ready for her to be a "Big Girl" yet, after all.